Boots into OS9 yet runs OSX 10.4.11 allowing you to use fairly modern browsers and software. This nicely upgraded refurbished QuickSilver features an optimized processor running 800* MHz PowerPC 7450 (G4) (optimized 733) processor with the AltiVec "Velocity Engine" vector processing unit and a 256k level 2 on-chip cache. We install refurb ComboDrive (reads DVD's, burns CD's) and include Toast. 512MB of RAM Installed (tested used). We put in a refurb 40 GB Drive for increased performance. No zip (optional, call) We thoroughly clean and rigorously test each unit. NVIDIA GeForce2 MX (AGP 4X) video card with 32 MB of SDRAM (Quartz Extreme in X), and a digital audio sound system with a highly-efficient Tripath "Class T" amplifier in a translucent silver and white tower case with a fold down door on the side that makes upgrading very easy. Includes as all G4's do the standard 2 port USB1.1 and 2 Firewire 400 ports. Fast 133mhz Bus. 4 open PCI slots for expansion. Built in Gigabit Ethernet, NO MODEM - add a built in 56K Modem +$10. Install more ram $49.77 for 512MB (holds 1-1/2GB Total). These systems come with two each built in Firewire and USB ports. These units have Apple's ADC or HD15 (PC Style) Video out. OSX Tiger and OS9.2.2. This units processor is just under Leopard's requirements. Manual (.pdf) and free Kitchen Sink DVD on system. Order mouse or keyboard separate. Call to add Wireless-N $34.77, or ask about other build options! We will sub in a Brand NEW Digital 120GB Hard Drive in place of the refurb 80 for +$60 Call. Our $349.77 price includes domestic shipping. Sell us or let us repair your old unit. Call or email. 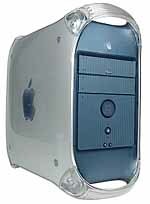 Power Macintosh "QuickSilver" G4 867 MHZ 512MB RAM, 40GB HD, SuperDrive $379.77 INCLUDES SHIPPING! Still capable of booting in OS9 yet runs OSX 10.4.11 allowing you to use more contemporary browsers and software. This nicely upgraded refurbished QuickSilver features an 867 MHz PowerPC 7450 (G4) processor with the AltiVec "Velocity Engine" vector processing unit and a 256k level 2 on-chip cache, & 2MB LEVEL 3 CACHE. We install refurb SuperDrive and include Toast. 512MB of RAM Installed (tested used). We put in a refurb 40 GB Drive for increased performance. No zip (optional) We thoroughly clean and rigorously test each unit. NVIDIA(AGP 4X) video card with 32MB of SDRAM (Quartz Extreme in X), and a digital audio sound system with a highly-efficient Tripath "Class T" amplifier. Includes as all G4's do the standard 2 port USB1.1 and 2 Firewire 400 ports. Fast 133mhz Bus. 4 open PCI slots for expansion. Built in Gigabit Ethernet, NO MODEM - add a built in 56K Modem +$10. Install more ram $49.77 for 512MB (holds 1-1/2GB Total). These systems come with two each built in Firewire and USB ports. These units have Apple's ADC or HD15 (PC Style) Video out. OSX Tiger and OS9.2.2. This units processor is LEOPARD CAPABLE and is an option(CALL). Aftermarket keyboard and mouse available extra. Call and ask about other upgrade options. Manual (.pdf) and free Kitchen Sink CD (a $9.99 value) on system. Our $379.77 price includes domestic shipping. ONE ONLY! 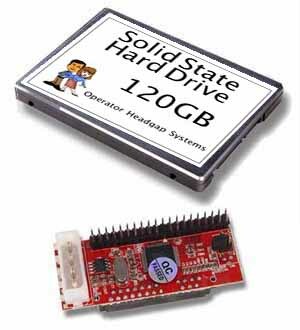 Solid State 120GB Drive Kit for your G4! Special Introductory Price! Operator Headgap tested and approved. Improve Performance! Now more affordable you can move up to the latest technology on your G4 and still run OSX or OS9.2.2 and boot from either. This 2.5" SSD comes with an adapter that features the ability to be set to Master, Slave or Cable Select for maximum compatibility. The 120GB Size is the largest size most G4 can run. FASTER DATA ACCESS! This speeds up almost everything you do on your Mac! More reliable than the old conventional drives, no moving parts, no noise. We include velcro so it is simple to mount anywhere that is convenient. WORKS in ALL G4 Macs and connect to a standard IDE connector. We preformat these and can preinstall call for custom configuration. Regularly $119.77 OUR $99.77 introductory price includes domestic shipping. Sweet Multiport - Add front ports for your PowerMac G4 Tower! Complete Kit! Sweet Multiport Kit. Add the convenience of ports at your fingertips. The Sweet Multiport installs in the second bay of your G3 or G4 (No Longer Available for QuickSilver Units). Add these ports and have them available up front, 2 FireWire ports, 1 USB port, 5-in-1 memory card reader, PLUS 2 more ports Firewire and USB available in the rear! Works in 9 or X! Fits in the second front bay (in place of the zip drive if you have one). This kit includes: Sweet Multiport front panel card, Sweet Multiport PCI card, Sweet Multiport inter-connect cable, Mounting bracket and screws, Front faceplate, FireWire and USB cables. The Memory Card Reader supports: CompactFlash, IBM Microdrive, Memory Stick, Secure Digital, MultiMediaCard. REQUIRES: Blue & White (door is gray however), G4 PCI or AGP units (no longer available for Quicksilver), a phillips screwdriver, and the ability to install a PCI card and remove your optical housing. When you plug the patch cable into a USB2 card you get a High Speed USB2 port under OSX in the front of your machine! Super deal for iPod users! Our $39.77 price includes domestic shipping. 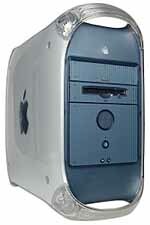 Power Macintosh G4 1.0 GHZ, 1 GB RAM, 80GB HD, SUPERDRIVE, Zip 100! $379.77 Includes Shipping! Sonnet High Speed 1.0 Ghz Processor! RUN OSX or OS9 on this Upgraded Sawtooth PowerMac G4. Burn your own DVD's/CD's. Watch DVD Movies! Pioneer SuperDrive (used tested) and include Toast. 1 GB of RAM Installed. 80 GB (used tested) 7200 rpm Drive for INCREASED performance. We thoroughly clean and rigorously test each unit. Video Card: 16 MB ATI RAGE 128 Pro. 100 Base T Ethernet Card, NO MODEM - add a built in 56K Modem +$10. These systems come with two each built in Firewire and USB ports. Manual (.pdf) on system. SuperSink DVD included. Keyboard and Mouse available extra. Has both DVI or HD15 (PC Style) Video out. $379.77 includes domestic shipping. Limited quantity order now. 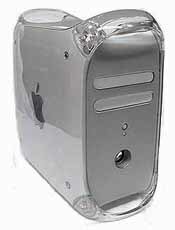 Power Macintosh G4/450, 512MB RAM, 40GB HD, DVD Play/CD Burn Combo Drive - $279.77 INCLUDES SHIPPING! Please allow 7-10 days on these units. RUN OSX or OS9. These Upgraded Sawtooth PowerMac G4/450's come nicely configured. We install our refurb Combo Drive and include Toast for easy CD burning. Plays DVD's. 512MB of RAM Installed. We put in a refurb 40 GB Drive (Fast New Solid State Drives available call). We thoroughly clean and rigorously test each unit. Video Card: 16 MB ATI RAGE 128 Pro AGP. Built in 10/100 Ethernet, NO MODEM - add a built in 56K Modem +$10. It has a spot for the optional Airport card. Install more ram $49.77 for new 512MB SDRAM. These systems come with two each built in Firewire and USB ports. Service manual (.pdf) on system. Keyboard and Mouse available extra. Free Super Sink DVD. Mac OS10.4.11 and 9.2.2 dual bootable. Weight: 30 lbs. Dimensions: 17"Hx8.9"Wx18.4"D. Has HD15 (PC Style) Video out. We will install a NEW Digital 120GB Hard Drive in place of the refurb 40 for +$60 Call. Our $279.77 includes your domestic shipping. Call for upgrades. Sell us or let us repair your old unit. Call or email. Apple Mac Mini G4 1.42 GHz 1GB RAM, 80GB HD, SUPERDRIVE, includes DVI (DVI-to-VGA adapter included) $364.77 includes shipping. Special Order. Run OS9 in classic mode from OSX 10.4.11 Tiger! Nicely configured with the maximum 1 GB of RAM, This Apple Mac Mini is powered by a 1.42 GHz PowerPC G4 processor with Velocity Engine and upgraded to the max 1GB of PC3200 (333MHz) DDR SDRAM! The built-in 80 GB hard drive provides adequate storage! BURN CDs and DVDs with the slot-loading SUPERDRIVE! Built in ATI Radeon 9200 graphics processor (32MB) with AGP 4X support. The super-compact design includes all you need, with integrated video with DVI-I out (includes VGA adapter), integrated audio, Ethernet LAN, USB 2.0 ports, and a FireWire port! Unit Dimensions: 2"x6.5"x6.5". Built in Wireless Extreme G gives wireless connectivity. Each unit is thoroughly cleaned and tested with Tiger 10.4.11 nicely configured with 9.2.2 classic installed so you can use your old Applications in classic mode and of course our Kitchen Sink X for plenty of additional shareware and freeware. Optional 10.5.8 Leopard capable call for options. While this unit comes with a power cord, the keyboard and mouse are extra. Use your old one or order from out input section any of the USB items (or see below). Add one of our new LCD monitors and you are good to go, or plug in your own. Our $364.77 price included domestic shipping. Limited quantities order now! Apple Mac Mini G4 1.25 GHz 1GB RAM, 40GB HD, ComboDrive, includes DVI (DVI-to-VGA adapter included) $199.77 includes shipping! IN STOCK! Run OS9 in classic mode from OSX 10.4.11 Tiger! Nicely configured with the maximum 1 GB of RAM, This Apple Mac Mini is powered by a 1.25 GHz PowerPC G4 processor with Velocity Engine and upgraded to the max 1GB of PC3200 (333MHz) DDR SDRAM! The built-in 40 GB hard drive provides adequate storage! BURN CDs and Play DVDs with the slot-loading COMBO DRIVE! Built in ATI Radeon 9200 graphics processor (32MB) with AGP 4X support. The super-compact design includes all you need, with integrated video with DVI-I out (includes VGA adapter), integrated audio, Ethernet LAN, USB 2.0 ports, and a FireWire port! Unit Dimensions: 2"x6.5"x6.5". NO AIRPORT. Each unit is thoroughly cleaned and tested with Tiger 10.4.11 nicely configured with 9.2.2 classic installed so you can use your old Applications in classic mode and of course our Kitchen Sink X for plenty of additional shareware and freeware. Optional 10.5.8 Leopard capable call for options. While this unit comes with a power cord, the keyboard and mouse are extra. Use your old one or order from out input section any of the USB items (or see below). Add one of our new LCD monitors and you are good to go, or plug in your own. Our $199.77 price included domestic shipping. Limited quantities order now!